Chip Alexander of the Raliegh News & Observer: Decision time for the Carolina Hurricanes is nearing on if they will be buyers, sellers or being status quo. GM Don Waddell said that after their road trip ends against the Senators, they’ll have a better idea. Pending UFA Micheal Ferland would be a good top-six rental for someone if they look to move him. 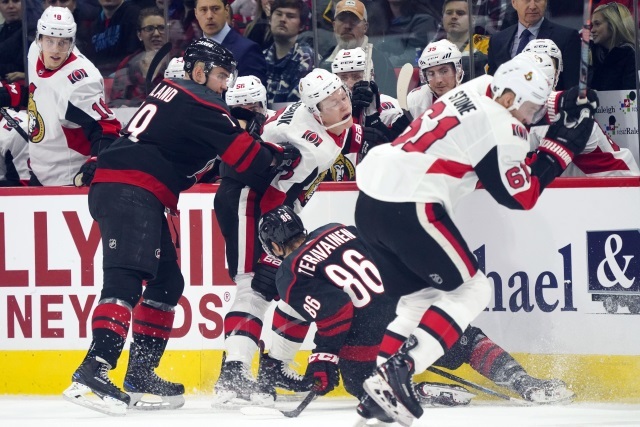 Chris Nichols of Nichols on Hockey: Darren Dreger on TSN 1260 was talking about the Ottawa Senators and their pending free agents Mark Stone, Matt Duchene and Ryan Dzingel. Maybe this week one or both of Matt Duchene and Mark Stone may come out and say this week that they aren’t going to re-sign with the Senators and will test the open market.